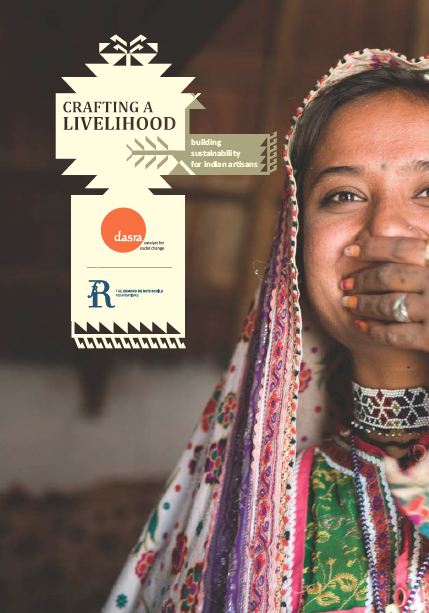 "Crafting a Livelihood: Building Sustainability for Indian Artisans" is a 2013 report from Dasra. India's industrialization and participation in the modern world economy is decades old. Despite that, millions of Indians still depend on indigenous modes of production, traditional skills and techniques to make a living based on handmade products. Artisans are the backbone of India’s non-farm rural economy, with an estimated 7 million artisans in India according to official figures (up to 200 million according to unofficial sources) engaged in craft production to earn a livelihood. However, propelled by loss of markets, declining skills and difficulty in catering to new markets, the number of Indian artisans has been rapidly decreasing, indicating the urgent need to re-invest in India’s artisans to safeguard history, culture and an important source of livelihood.